On 22 October 2012, the DGA and its British counterpart, DE&S, kicked off France’s evaluation of the Watchkeeper tactical UAV. France and the United Kingdom continue to cooperate on tactical UAVs, as provided by the Lancaster House Treaty, and confirmed on July 12 by the two countries’ Defence Ministers. The assessment of the British Watchkeeper by the French Army will allow our forces to define the conditions of close operational cooperation. The evaluation will begin this month with initial training of French operators. The flight campaigns will be conducted at Istres air base in 2013. The contract awarded by the DE&S on October 22 to Thales UK covers training of French operators and support for the in-flight evalluations, which includes transport, logistics and maintenance. The Watchkeeper is tactical UAV intended for ground forces that the British Ministry of Defence acquired in 2005. 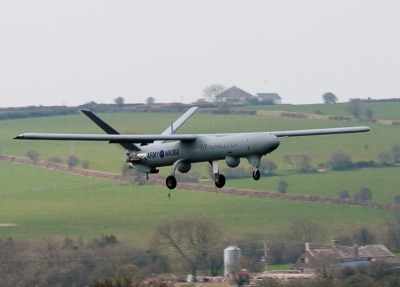 (EDITOR’S NOTE: While the Watchkeeper is eminently suitable as the short-term basis of bilateral cooperation on tactical UAVs, it is also a singularly troubled program, which has not yet entered operational service with the British Army, almost three years after it was due to. Its £800M development contract was awarded in Nov. 2005. There are serious doubts as to whether Thales UK has the requisite know-how to manage the program, which is largely an adaptation of the Elbit Systems Hermes 450 which has been in widespread service for over a decade.